Jason of Beverly Hills developed a history-making design for the Warriors to commemorate their 2016-17 title. 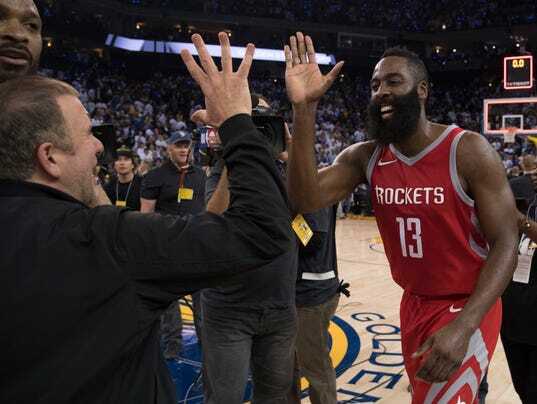 OAKLAND — Kevin Durant’s baseline jumper swished through the net just barely too late, and the Houston Rockets rallied in the fourth to beat Golden State 122-121 Tuesday on the night the Warriors received their championship rings. The Warriors had one last chance with 10.6 seconds left and Durant came up with the ball after Stephen Curry had missed. Durant and the Warriors thought they’d won and confetti began to fall when the two remaining officials — the third got hurt in the fourth quarter — reviewed the play and said Durant’s shot was after the buzzer. Can the Broncos contain — or just keep up with — Drew Brees?